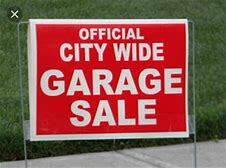 City Wide Garage Sale - May 2, 2019 to May 4, 2019 - Hastings Area Chamber of Commerce & Tourism Bureau, MN ? Hastings City Wide Garage Sale will be held May 2nd, 3rd, and 4th. The deadline to participate is April 22nd. Please call 888-425-2220 to sign up. The maps for the garage sale will be online April 28th - May 4th at www.hastingsstargazette.com and will be printed in the paper prior to the sale. The price for a 5 line ad is just $30.00.